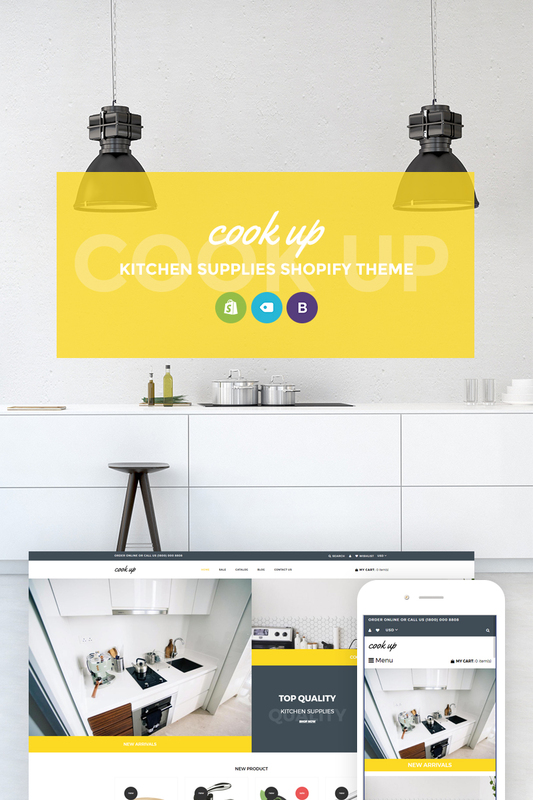 This Kitchen Supplies Store Shopify Theme is a simple solution for creating household items supply store. There are ready-made page layouts. By using available add-ons and plugins, you can present your products as nicely as possible. You can also conveniently organize a catalog with product categories, links, and beautiful photos. There are several types of sliders for presenting various categories of your items. Among them, the options for new, recommended, and related products. Also, there's a built-in section for the reviews. An ability to add to the cart and to the list of desired products, as well as an ability to compare the items, is implemented without the need to reload the page. The function of fast viewing of a picture of an item is also supported. Retina ready principle refers to a high-resolution display screen, where pixel density may be so high, so the human eye can't make out specific pixels. Retina Ready designs make all visuals and content appear sharper, brighter, and more vivid. Responsive layouts adjust to more compact and also greater display dimensions mechanically. Responsive design delivers a much better user experience for those people who view a site on a mobile phone or a tablet, and at the same time enables you to boost rankings of a website in search engine results pages. Bootstrap allows to produce responsive, mobile-first projects in a smooth way. Is it possible to buy the particular image from the Drinks Shop Shopify ecommerce template? No. According to our Terms and Conditions we never sell the images separately from Shopify themes for Food & Drink (as well as the templates separately from the images). What is a one time usage license for a Shopify design for Drinks Store? 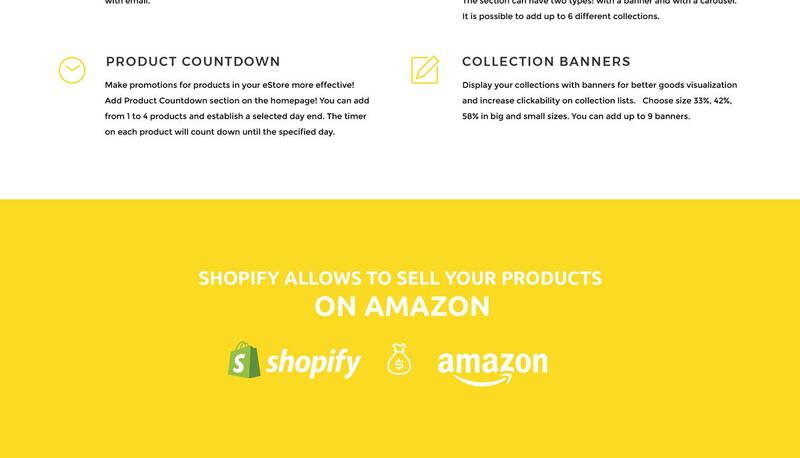 When you buy the Shopify design for Drinks Store at usual price you automatically get the one time usage license. It enables you to use each individual product on a single website only, belonging to either you or your client. You have to purchase the same template again if you plan to use the same design in connection with another or other projects. When passing files to your client please delete the template files from your computer. Is it possible that Template Monster will contact my client which website I made from Template Monster's website Shopify ecommerce theme for Drinks Shop? Yes, our legal department checks licenses regularly. In case we won't find designer's contact information on the site which was made from the Shopify ecommerce theme for Drinks Shop of ours we will contact the owner of the site directly. Are there any limitations on selling the Shopify design theme for Food Delivery Services as the integral part of my new product? Can I resell Shopify design themes for Frozen Food Packaging I bought the developers license for? You cannot resell the customized Food Shopify theme as a template, but you may sell it as a project to your client. Can I use graphics from Shopify template for Restaurant I purchased for use in printing? Yes, it's not prohibited to use the Shopify template for Restaurant graphics for printed material, but the resolution of the templates graphics ( except for logo templates) is not enough for printing. Are there any discounts if I'm buying over 10, 20, 30 or more Shopify ecommerce template for Food? Please email to marketing@templatemonster.com with your inquiries about Shopify design themes for Vegan Food. Is it reasonable to make unique purchase of Food & Restaurant Shopify design theme that was already purchased before? Yes, it's reasonable to make a unique purchase of Food & Restaurant Shopify design theme. Because there is very small chance that you will find the same design on the net. There are more than 3,000,000,000 webpages online now according to statistics on www.google.com. Can I apply a discount code to a discounted Shopify design for Vegitarien Food or combine several discount codes together to get better price? I ordered a Shopify design for Drinks Store but haven't received the download information. In case of not receiving the download information of a Shopify design for Drinks Store, please contact our Billing Department via support chat by phone or e-mail. Can I customize the Shopify design theme for Food & Drink Store if that's required by application settings? Yes, you can customize the Shopify design theme for Food & Drink Store code, graphics, fonts to any extent needed. Make sure that these charges for Food & Drink Store Shopify template have different order IDs. If it is so, contact our billing department. Can I customize the Shopify ecommerce theme for Drinks Shop? Yes, you can customize the Shopify ecommerce theme for Drinks Shop to any extent needed. You cannot use a header of the template for one project though, and images from the template for the other project. How many applications, programs etc can I use to integrate with the Food & Drink Shop Shopify ecommerce themes under one extended license? The extended license gives you the right to use the purchased Food & Drink Shop Shopify ecommerce themes for the integration with one software/freeware/application/CMS/sitebuilder only. In case you would like to use the template with the other application, the other license is to be acquired. Will TemplateMonster help me to install my Food & Restaurant Services Shopify theme? Some of our products like osCommerce templates, Zen Cart templates, etc. require installation to operate. Installation services are not included in the package price. TemplateMonster though offers you a variety of sources to help you with installation of your Food & Restaurant Services Shopify theme including installation instructions, some articles with our Online Help Center. Our Knowledgebase contains customers questions and most frequent problems. Anyway, you can always refer to our partners from TemplateTuning.com to install your Food & Restaurant Services Shopify theme for you for a small fee. What are the advantages of purchasing a Shopify design theme for Food & Drink? The major advantage of purchasing a Shopify design theme for Food & Drink is price: You get a high quality design for just $20-$70. You don't have to hire a web designer or web design studio. Second advantage is time frame: It usually takes 5-15 days for a good designer to produce a web page of such quality. Can I put a line at the bottom ( or any other spot) of the customized Shopify design for Drinks Store "Website design by Company name"? No, you cannot place a line at the bottom ( or any other spot) of the customized Shopify design for Drinks Store saying "Website design by Company name". Nevertheless, you can place "Customized by Company name". What am I allowed and not allowed to do with the Shopify themes for Food and Beverages? You may: Build a website using the Shopify ecommerce template for Food & Drink Shop in any way you like.You may not:Resell or redistribute templates (like we do).Claim intellectual or exclusive ownership to any of our products, modified or unmodified. All products are property of content providing companies and individuals.Make more than one project using the same template (you have to purchase the same template once more in order to make another project with the same design). Are your Shopify designs for Food & Restaurant News compatible with any CMS? What is a unique purchase license for Shopify template for Organic Food Store? If you purchase the product at a 'Unique price' it guarantees that you are the first and the last person to buy this Shopify template for Organic Food Store from us. It means that this template has not been sold before and you become an owner of a unique design. After this kind of purchase the template is being permanently removed from our sales directory and is never available to other customers again. The unique purchase license allows you to develop the unlimited number of projects based on this template, but the template should be customized differently for every project.